As I mentioned before, the resonance form(s) of lowest energy are those where the charges are minimized. However, sometimes you can’t get around it: you have to put a charge somewhere. Last time I talked about the principles involved in deciding where best to put a negative charge: on the least basic atom. Today I’ll talk about the opposite situation: where to put a positive charge. There are really one main principle to think about when deciding which site will stabilize positive charge the best. Recall the one sentence summary of chemistry: opposite charges attract, like charges repel. Electron-poor atoms are stabilized by adjacent electron-rich atoms. Electron poor atoms are destabilized by electron-poor atoms. To be more specific, there are three main ways this plays out when evaluating resonance structures. It’s probably this first principle which causes the most confusion of all. 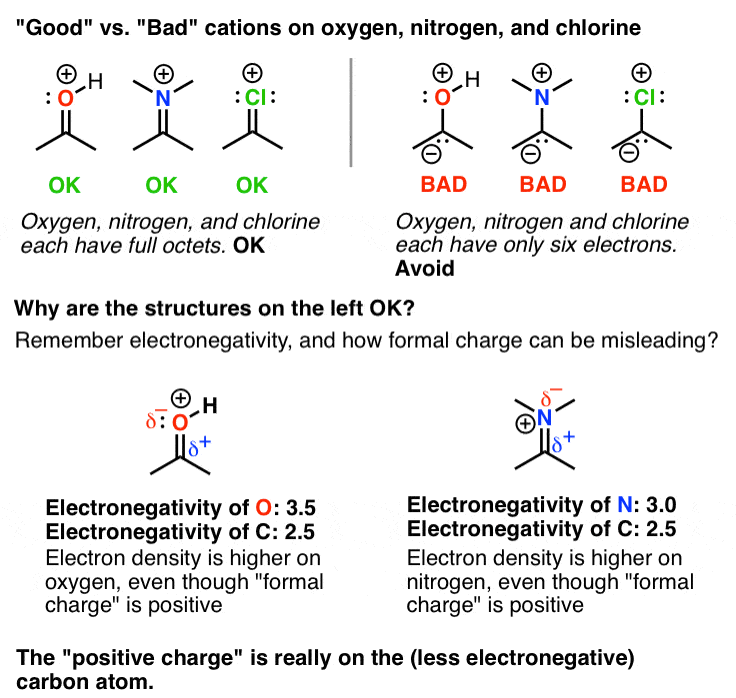 Let’s look at the “best” and “second-best” resonance forms for these positively charged species. Notice how in each one, the second-best resonance form has a carbocation – that is, a carbon with six valence electrons. The best resonance form has a new π bond that has been formed through the donation of a pair of electrons on the adjacent atom (O, N, Cl, F). In the process we put a positive charge on that atom. Why is this weird? Because up to this point, you’re probably used to thinking of atoms like F, O, Cl, and N as the “electron Scrooges” of the periodic table. Due to their high electronegativity they take electrons away from whatever they’re attached to. Here’s an important new concept: When atoms with a lone pair are adjacent to an atom with an empty orbital, formation of a π bond will be favored. Remember that formation of a chemical bond is an energy-lowering event. The “loss” of a full lone pair on the donating atom is more than compensated for by the energy released through formation of a new π bond to the empty orbital. We call this π donation. It’s such an important concept there will be much more to say about it in a subsequent post, but if you want to anthropomorphize matters here, you can compare F, O, N and Cl to famous Scrooges such as John D. Rockefeller, Andrew Carnegie, and even Bill Gates: while they may have been thought of as greedy, they also have a philanthropic side. Just one thing to note: although it might look “bad” to put a positive charge on electronegative atoms such as O, N, Cl, and F, this is OK in these cases because if you look closely there is a full octet of electrons on each of these atoms. Recall that the “positive charge” we draw is actually formal charge, and remember that formal charge does not always reflect electron density. So in these cases these atoms are not actually electron-deficient. 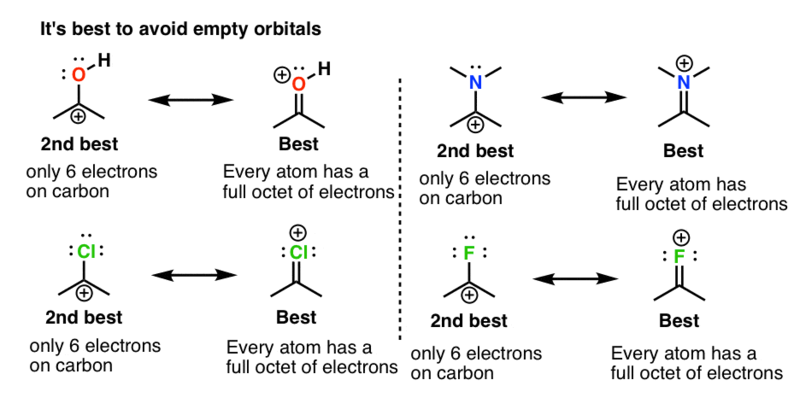 However it’s important to distinguish between these types of positively charged atoms, and those in the diagram below which lack a full octet. It is extremely energetically unfavorable for atoms like F, O, and N to have less than a full octet of electrons. Avoid! Here comes the second most important principle when it comes to stabilizing positive charge: if possible, it is best to place the positive charge on the most substituted carbon atom. As I often say to my students, “if you’re poor, it helps to have rich neighbors”. The stability of carbocations increases with the number of attached alkyl groups. 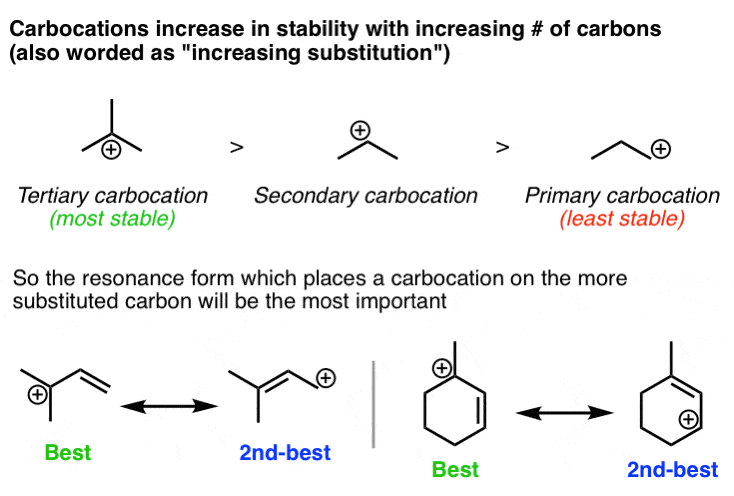 It might be useful to review the 3 factors that stabilize carbocations. The last factor to keep in mind is essentially the inverse of what we just discussed. Carbocations are destabilized when adjacent to electron-withdrawing groups. Now it’s important to add the caveat – electron withdrawing groups that cannot donate a lone pair. So we can put groups such as CF3, NR3,(+) COOR, COOH, SO3H, NO2, and others in this category. Let’s have a look. Note that in each case the carbocation is attached to a group which is removing elecron density from it *without* being able to donate a lone pair of electrons. 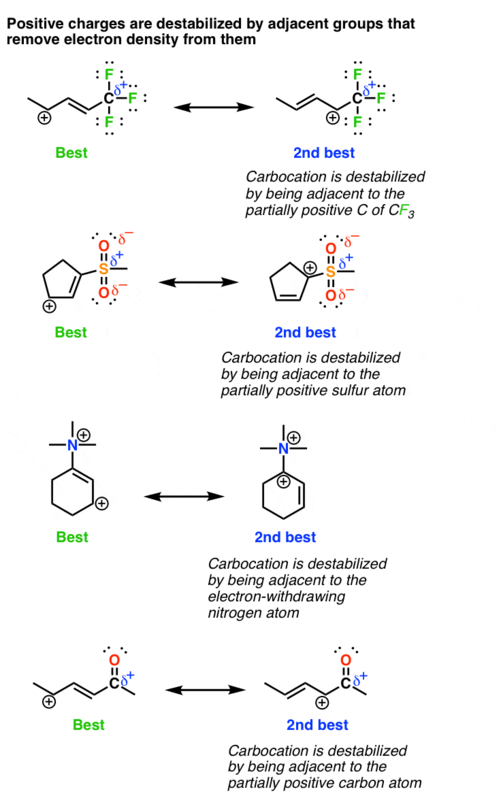 Again, it might be useful to review the 3 factors which destabilize carbocations. So hopefully that (mostly) covers an introduction to evaluating the stability of different resonance forms. In the next few posts, we’ll start to look at how to apply resonance to find the reactive sites on a molecule. Think you dropped a positive charge on the structure on the left of the first example in the last figure! And you also have a “carocation” in the 10th paragraph (the one between the 3rd and 4th schemes). But otherwise, great work. As usual! thanks all for the helpful corrections, I’m going to update when I get a spare second! Just noticed… the top right example in the same scheme (the one with the mesyl group) illustrates my point. Some students would expect the 2nd structure to be the best resonance form due to the tertiary carbocation, vs. the secondary carbocation in the 1st form. Nevermind… I’m an idiot. Having trouble reading Lewis structures today, or I forgot the definition of a “tertiary carbocation”. Need moar coffees. ok,jess.the dfinition of tertiary carbocation is that the carbocation should be attatched directly to three actual carbons.look carefully that in these cases they are actually secondary as the third atom is actually not carbon but nitrogen or sulphur. Thanks, I got it (eventually). A bad case of my reply-button-clicking-finger working faster than my brain. *Great* point. This is a case where a tertiary carbocation would be less stable – you’d have it adjacent to an electron withdrawing group. There’s always exceptions, aren’t there? Just in case anyone wants the name of the compound in the lower left of the last figure it’s N,N,N-trimethylcyclohex-1-enaminium. Just thought you all would like to know that as it took me several hours to find out it’s name and I must give all the credit to an anonymous person at another chemistry related board. Dude, you need to get hooked up with Chemdraw. The “convert structure to name” function will help (almost) all nomenclature questions.